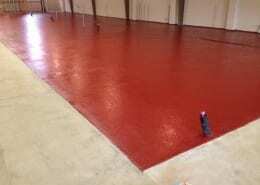 Description: Cascade Floors heavy duty epoxy system is a no odor 3 component resin rich flooring system that is installed at ⅛ to ¼ ″ thickness or greater. 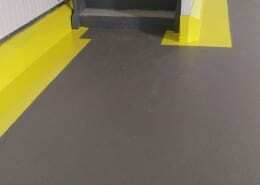 Intended use of area as well as traffic and type of cleaning service determine the thickness of application. This system is most generally designed for heavy chemical use areas and food processing applications. 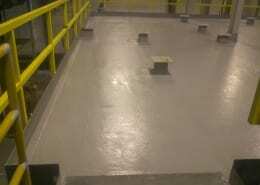 Cascade Floors heavy duty epoxy systems have very tough and durable physical properties and are based on a tried and true formulation used in the food processing/chemical/circuit board manufacturing industry by Cascade Floors Inc. since 1971. Packaging: Resin components come in 1, 3, and 5 gallon kits. 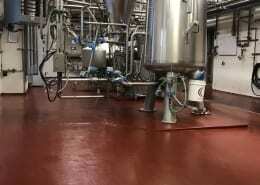 Because we blend our resin base in liquid form we can have a very consistent color throughout the entire flooring system (unlike other flooring systems on the market) will yield consistent color throughout. First layer is applied by pouring blended resin onto floor and spreading with a 24” squeegee and sanded with #16 silica sand to refusal. First layer to set for 1-3 hours to cure and set for sweeping. 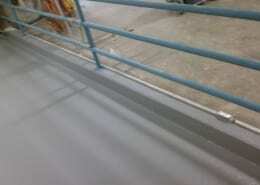 Second layer is applied in the same manner as the first layer, using #4095 silica sand filled to refusal. 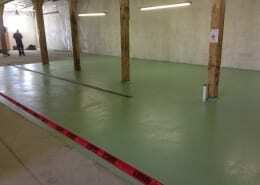 Third layer/top coat is applied by 18-24” squeegees pulling the liquid resin over the sand to even out resin and prevent puddling as well as give a very even non-slip texture. Aluminum oxide grit or #16 grit silica will be broadcasted according to desired non-slip of customer. 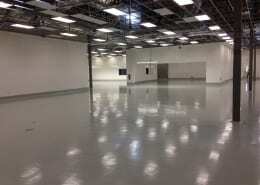 Your newly applied Cascade Floors heavy duty epoxy system is ready for service in 24 hours. 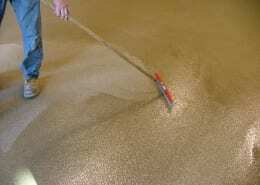 * 3M color quartz blended aggregates can be substituted for #16 grit silica using a clear blended resin for a multi colored floor.